Today, I'm sharing a few treats and trinkets I've recently acquired that have earned 5 gold stars in my book! Feast & Dwell candle // I picked this up at my sweet friend Jen's amazing newly opened shop, Moulton. 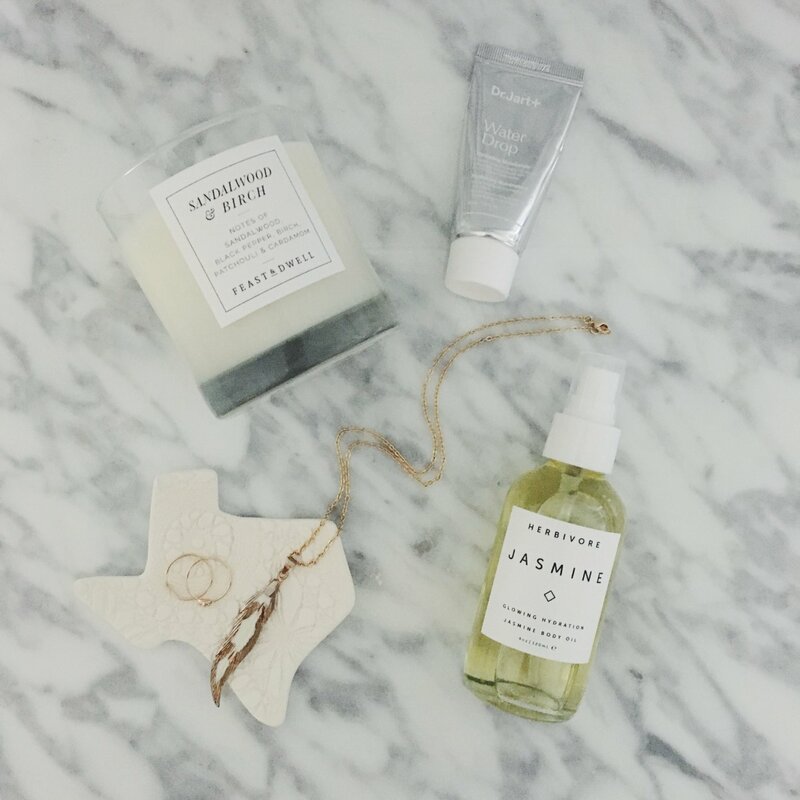 Curated to perfection with lots of artisan goods, I couldn't resist taking home the sandalwood and birch candle. Dr. Jart Water Drop Moisturizer // This lightweight moisturizer arrived in my Sephora Play! box, and I love how it melts into my dry skin without an overly dewy finish. Nobody's got time to run errands looking like a greaseball! Herbivore Jasmine Body Oil // I don't have much time to go beyond the basics when it comes to personal care these days (my ratchet hair and ragged nails can attest to that), but this natural body oil I picked up at Cove makes me feel like a million bucks. The smell is out of this world yummy, which offsets the 'eau de spit up' that I am usually wearing. The Champagne Gypsy Feather Necklace // The perfect necklace that dresses up my basics for everyday, and is a staple in my layering game. Bonus points that Astra, the maker of these pretty baubles, is one of the kindest souls I've ever had the pleasure of (virtually) knowing. Lemon Glaze Ceramics Texas Dish // Handmade in Texas (obviously), this dainty dish holds my rings and earrings and other trinkets when I call it a night....at like 8pm. I'm such a granny, which is exactly who this dish reminds me of with its pretty pressed lace pattern.